Mercury Rising in Tuna, But Will Concern Last? Marian Burros of the Times had a revealing piece today on tuna sushi, showing that restaurant and store samples had so much mercury that six pieces a week would be deemed a health risk by the EPA. The story ranked as the most emailed item on the Times' web site, evidence of just how much health concerns prompt reaction from readers and eaters. The question, though, is whether this concern will last. When stories came out on the risk of PCBs in farmed salmon, sales dipped by about 20 percent for about six months. But Tim Fitzgerald, a scientist in the Oceans Program at Environmental Defense, told me in a phone call this morning that sales rebounded and "now they're higher than ever." This parallels food scares in general. An immediate high-profile story will lead to a change in habits, but then memories will fade and habits return -- that is, if there are habits to return to. To gradually change consumer tastes over the long-term is more difficult, but doable, and takes work on the chef side. For if restaurants don't serve it, diners won't eat it. In the case of tuna, Burros quoted a restaurateur and retailer who expressed surprise at the findings. (Reminds me of that line from Casablanca, "I'm shocked, shocked to find that gambling is going on in here!") If you are in the seafood business, you'd have to be deaf, dumb and blind to ignore the mercury warnings on tuna, especially in larger species like bluefin where mercury are known to accumulate. I was also surprised that so many of the restaurants were actually serving bluefin tuna, a species that is so close to collapse (that is, disappearance) that eating it is akin to dining on an endangered species. There have been gobs of articles on the plight of the bluefin for years, and this illuminating piece from 60 Minutes this past weekend that is worth watching if you haven't seen it. But since this warning has clearly not yet struck a chord, chefs continue to turn a blind eye and serve the fish up. (Not to oversimplify, since some chefs and groups such as Chefs Collaborative do emphasize sustainable fish). Now, I imagine, this series will alter menus, at least initially. Fearful of mercury poisoning, eaters will shy away from tuna and restaurants will have to avoid bluefin, unless they want to put warning signs on their menus. The upshot: maybe bluefin will now have a chance at rebounding, if restaurants switch to other more sustainable and lower toxicity species, such as yellow fin tuna. But if chefs don't respond, diners will continue to get doses of mercury until the big tuna run out. 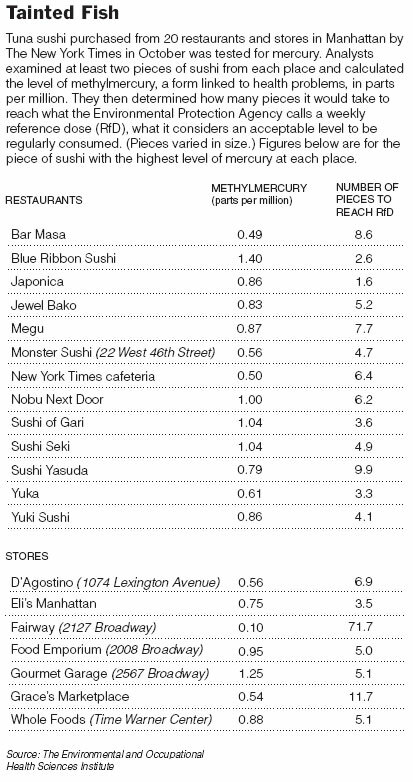 To see how restaurants and supermarkets fared in the actual tests, check out the Times' nifty graphic.